Three people were killed and 23 others were injured just before rush hour on Friday after a double-decker bus crashed at a busy transit station in Ottawa. Paramedics said some of the passengers on the OC Transpo bus suffered critical injuries. Westboro: Confirming 17 patients injured in the collision. Some in critical condition. Further updates to follow. #Ottnews. Ottawa Emergency Services transported the injured from Westboro Station to a local hospital. Pictures posted to social media show a large presence of first responders at the busy transit station, and substantial damage to the front end of the bus. Injured passengers were being treated by paramedics on the ground surrounding the bus. 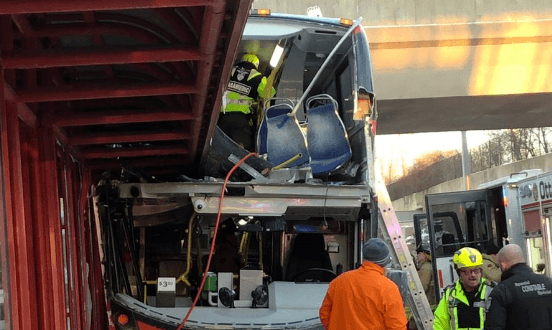 In a press conference, Ottawa’s Police Chief said the most serious injuries involved people sitting on the second-level of the bus. Ottawa Police said in a statement its collision investigation unit was on scene and is investigating. The department said it would provide further information shortly. Part of the Transitway, a main artery for commuters, was closed in the aftermath of the accident, and police warned people to stay away from the area. The station was deemed an “active emergency site” and all buses have been re-routed. Press Conference to provide update on Westboro bus station incident taking place tonight at 7 p.m. in Festival Plaza at City Hall. I will be joined by @JLeiper, @AllanHubley_23, City Manager Steve Kanellakos, John Manconi, Police and Emergency Services Chiefs.